As Facebook is ever evolving, we also need to evolve with Facebook. If you are an active member in our Facebook community, you have already noticed these efforts. We do have two Fan Pages, the "old" fan page is going to now be utilized as our Blood-Horse Publications corporate umbrella, which is named "Blood-Horse Publications" after all =). 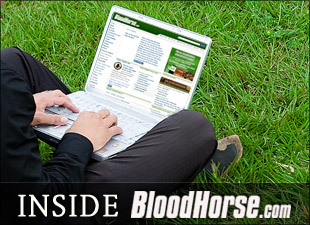 The content from BloodHorse.com and The Blood-Horse will now be regularly posted at our new fan page, Facebook.com/TheBloodHorse. The Blood-Horse fan page is already rearing to go, it has acquired 2,000+ fans in two weeks! You all rock our socks off! Please come join the conversations with the racing fans, industry members and other people on our fan page! This week will mark a change in our blog stable. The Blood-Horse magazine feature, Final Turn, is being modified into a more profile like feature named The Winner's Circle. Online, Final Turn will be turning a new leaf as we start posting The Winner's Circle as a blog and discontinue Final Turn. A shout out to TheHorse.com who recently was voted BEST international use of Twitter in the Equestrian Social Media Awards. Yesterday TheHorse.com also won third place for BEST use of Facebook, international. "What’s great about this was when the ESMAs were first started, Facebook fans nominated their favorites for the different categories. At first it was meant for the UK, but then quickly expanded internationally. The group took the top ten nominees (they have a UK/Ireland category and International category) and then started the voting process, which lasted from mid-January to mid-February. This was all user-generated. We (TH.com) did a little bit of campaigning, but not as much as some of the others, which may be a good testament to our current, and growing, presence in social media."